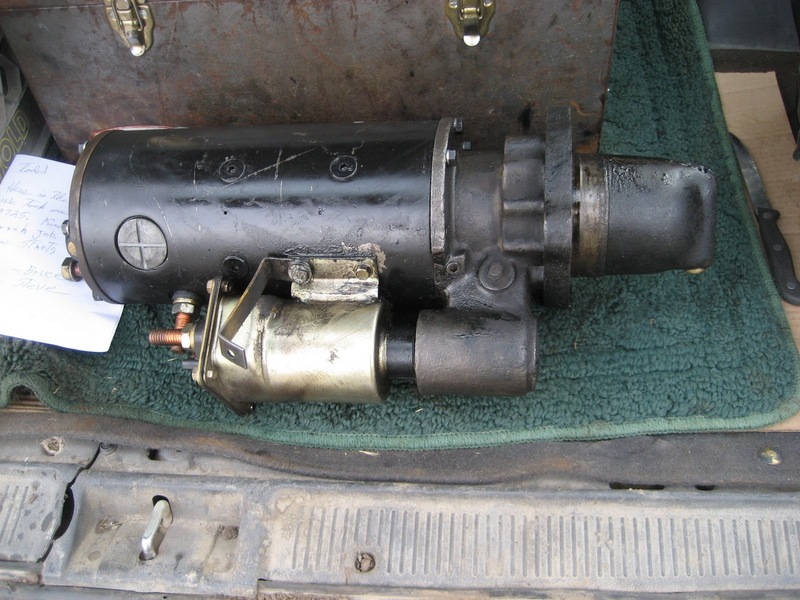 Most of us who may have fooled around with cars in our youth have probably replaced a starter or two in one of the cars we have owned. For contrast, consider the change-out of a starter on a 3600 hp diesel engine; 20 cylinders with a total displacement of 12,900 cubic inches. Actually it isn’t that much different than an automobile except that the starters are considerably larger and there are two of them. 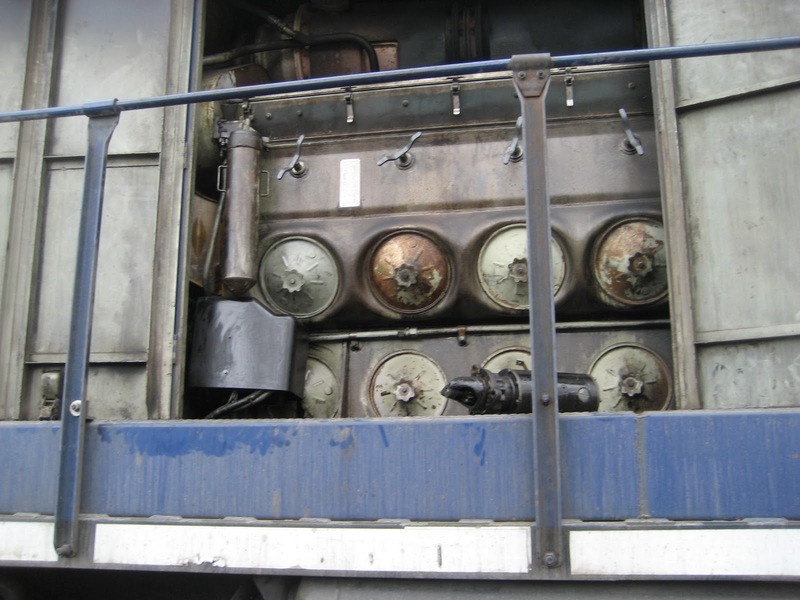 32 volt machines hooked up in series so they receive 64 volts and a lot of amps from the locomotive’s onboard batteries. First, contemplate the failure. At one point it was quite spectacular! 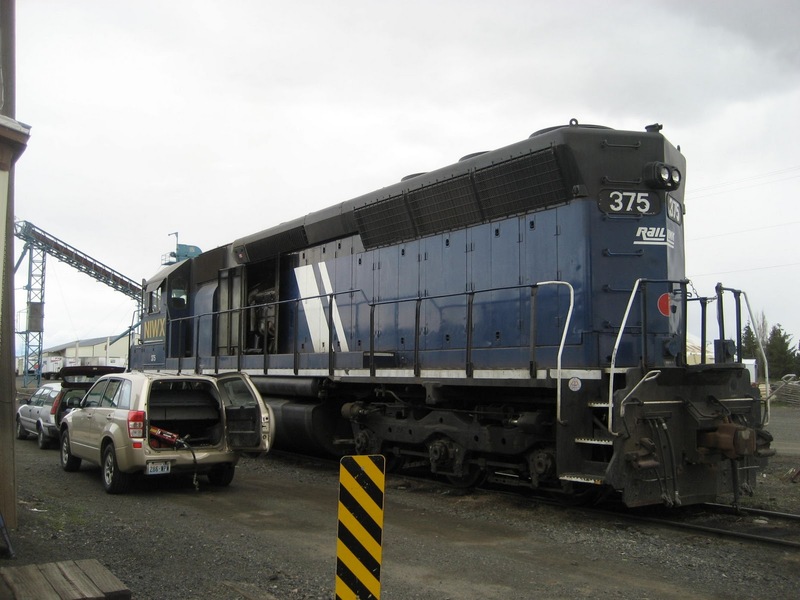 Locomotive 375 was one of two at Coulee City WA on Friday 5/6/2011 scheduled to pull 17 loaded grain cars and 1 empty flat car eastbound to Davenport WA that day. Both units had been shut down after arriving in Coulee City the previous day with the empty cars. While the 2891 started right up, 375 wouldn’t even crank. Low batteries were the suspect culprit. After some trial and error, we started the Kim hot-start unit with the hope that it would charge the batteries enough to start the 375 later. 2891 was able to pull the train, and push the dead 375, up the grade out of Coulee City and over the hill at Hanson by itself. Our attempt to start the 375 at Almira was an even bigger failure. On to Davenport. We topped rattlesnake grade at 15 mph and even managed 11 mph on Wilbur hill. The train was tied down for the night at Cemetery Rd, just west of Davenport. Saturday in Davenport, we hooked jumper cables from 8924 to 375 and after letting it charge for awhile, attempted a start. We got a few clicks but no cranking. At that point we removed the cover over the twin starters and tried again. Flames shot at least a foot out of the end of the top starter and fire burned for what seemed like a long time before it finally flickered out! Very impressive! At least now we knew where the problem was. Sunday afternoon after some serious contemplation of the project, I decided that we could probably change the starter ourselves. I called Steve Gibson and he was game to give it a try. Steve called Todd Havens, President of Western Rail in Airway Heights and received permission to pull a used starter off of one of their parts locomotives. Steve and I met at Western Rail about 2 pm and pulled the bottom starter off of our former unit 8925. This gave us a taste of what we were up against. Fortunately I had the needed wrenches and sockets in my toolbox. On to Davenport where the 375 was waiting. First task was to take a few pictures and some notes on how the starters were wired up. This picture shows the defective top starter. 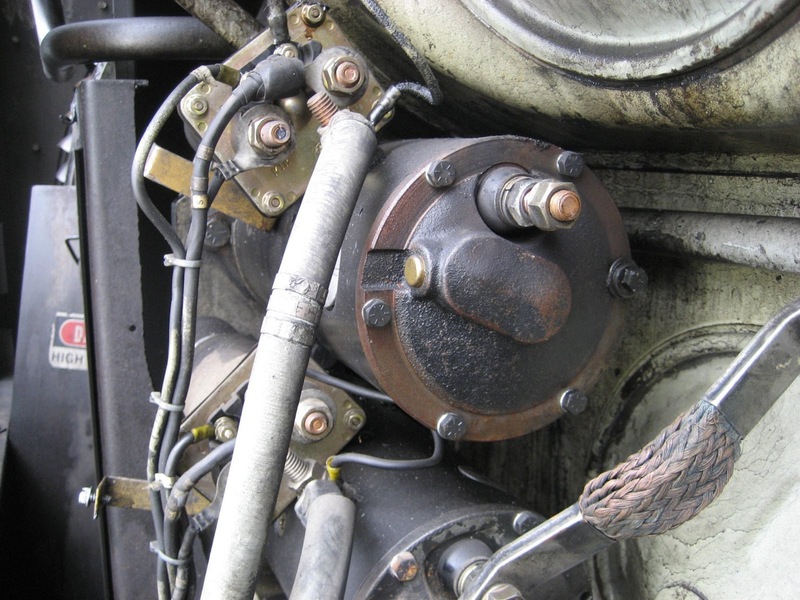 The top of the lower starter is seen at the bottom of the picture The jumper wire which connects the two starters in series is shown at the lower right. It has already been disconnected from the upper starter. The flames had seemed to come out from around this bolt. These starters are about 2-1/2 feet long and weigh about 100 pounds EACH! I didn’t take any pictures while we were doing the actual swap of the starters as it was messy and we were rapidly getting filthy. 3 big bolts held each starter in place and it was close quarters work getting the nuts off of these bolts. Finally the job is done and the 375 IS RUNNING! Spun and started just like it always did. Both starters are behind the black fiberglass cover at the lower left center. The old starter is lying on the running board behind the handrail post. Another view of the now running 375. It will soon be heading west toward Coulee City with the 8924 and another empty grain train. Todd asked us to return the old starter to Western Rail as a core. I dropped it off on my way home. This picture of it in the back of my car gives a idea as to it’s size. Nifty story. Thanks, Bruce. "I had no idea."